Sen. Brady Forrest, G-at-Large and president pro tempore of the senate, said he helped create the guidelines for the new policy to encourage organizations to work with the SA. Updated: Sept. 28, 2017 at 10:03 p.m.
Student organizations can now have a larger say in Student Association legislation. In a notice to the SA Senate Monday, Executive Vice President Sydney Nelson said student organizations can now formally endorse any of the senate’s bills or resolutions. This will allow groups to officially attach their names to SA measures, rather than just sending group leaders to voice support during meetings. Nelson said the change will help student organizations and the SA work more closely together this academic year on topics they both care about. Nelson said the measure will better incorporate student organizations into the senate process. She said the policy was created after she and SA President Peak Sen Chua worked closely with Students Against Sexual Assault to craft an August resolution urging the University to review its Title IX policies. “Having this line for endorsers really allows senators to engage in organizations, to directly incorporate their feedback, their ideas and thoughts,” Nelson said. Any recognized student organization or member of the SA’s executive branch can endorse legislation if the group was involved in crafting it, according to endorsement guidelines sent to the senators Monday. She said senators do not normally approach student organizations for input until the spring – when SA elections are typically held – which has become a “culture” that SA leadership is trying to change this year. Sen. Brady Forrest, G-at-Large and president pro tempore of the senate, said he helped create the guidelines for the new policy in hopes that it will encourage organizations to work with the SA on subjects important to their membership. Organization leaders must also submit written approval of the final draft of the legislation, which Forrest said ensures student leaders approve of the final version of legislation they are formally backing. If a bill or resolution sponsored by a student organization is altered in the senate, a student organization can “opt out” of its endorsement, Forrest said. 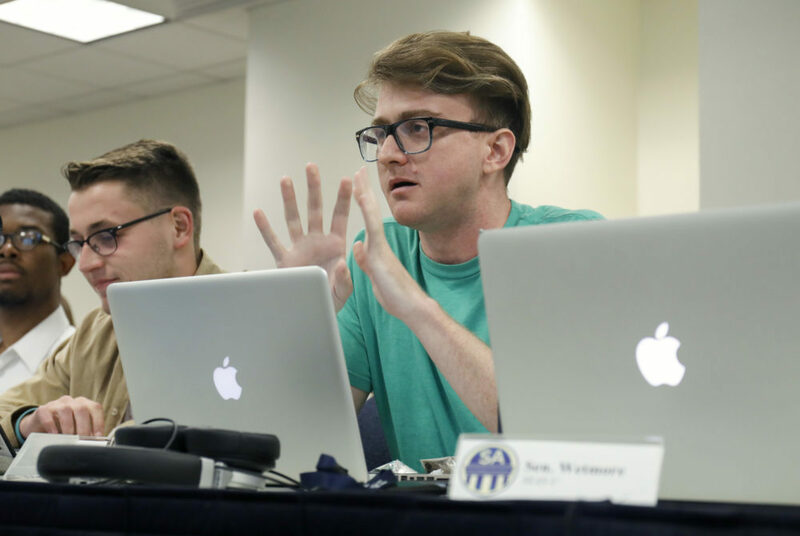 SASA Vice President Bailey Bystry said the organization felt more included in the senate process when they became the first student group to formally endorse legislation with the Title IX resolution last month. “Every time SASA has worked with members of the SA on a resolution, those members have made a point to openly credit SASA and thank us for partnering them, so it’s nice to see that this practice will be institutionalized,” she said in an email. Jazmin Kay, the president of the College Democrats, said she hopes to utilize the endorsement policy to help craft legislation with senators and other student groups to expand mental health resources, prevent sexual assault and support survivors. “We are optimistic about this new policy and hope it can serve as a vehicle for student organizations and the Student Association to come together and advocate for legislation that helps empower and support all students,” she said in an email. Justine Coleman and Cayla Harris contributed reporting. This article appeared in the September 28, 2017 issue of the Hatchet.